With so many sleeping options in Marrakech, it might get a bit overwhelming. Marrakech is well known for its boutique style hotels, also known as riads. Riads are traditional Moroccan homes build around a garden or courtyard. Since most of the riads only have six to ten bedrooms, the service is very personal. So hereby, my favorite riads in Marrakech. They got a thing or two in common; great friendly staff and incredibly beautiful interior. What more could you wish for? So planning your next city trip? Go to Marrakech and stay in one of those dream riads. The moment you enter Dar Rbaa Laroub you’ll be in an oasis of tranquility. French owner Jean Noel knows a thing or two about making a place let you feel welcome. The interior has a true French je ne sais quoi. It all looks like coincidence but it’s all well thought through. Great music, curios everywhere, fireplaces in your room and the most beautiful plants all over the place. Dar Rbaa Laroub probably has the most impressive rooftop of all the riads i’ve seen. With cactuses, fat plants and palmtrees the rooftop is a true urban garden with lots of little nooks to enjoy your breakfast or a fresh mint tea. A little bit on the outskirts of the souks, this riad gives you all the peace and quietness after a crazy day in the shopping mecca. Riad Tizwa is a very authentic riad, with beautiful Moroccan details. A quiet courtyard, a cozy rooftop with great views, ceilings that will blow your mind and comfortable rooms, it’s all part of the deal. The bathrooms are almost as big as the rooms itself, and this doesn’t mean that the rooms are tiny. Since size does matter in certain situations, I should tell you about their breakfasts as well. They are huge. Fresh fruits, Moroccan yoghurt, dried fruits, croissants, bread, Moroccan style pancakes, name it and it will be at your breakfast table. Besides that Riad Tizwa has great staff that will assist you in any way. Helping you out with restaurants, prices (since everything is a haggle, this is very helpful!) and anything that will make your stay more pleasant. If you are looking for a smashingly good-looking riad, but are a bit on a budget, then Riad Vert is your place to go. With relaxing rooms for only $50 a night this really is a gem. 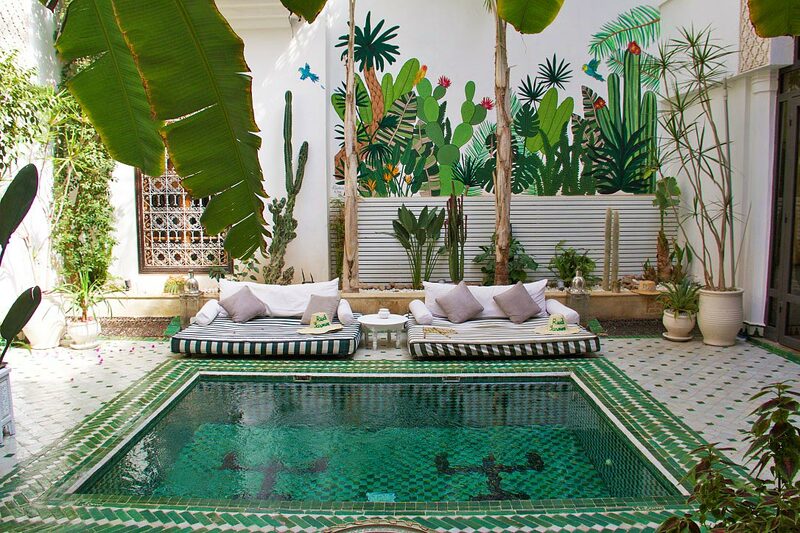 Riad Vert lives up to its name with beautiful green tiles everywhere feeling like a true oasis. Having breakfast in the green courtyard or up on the roof with an amazing view over the medina is a real treat. And guys, they have a rooftop pool! Unlike all the other riads, who have pools in their courtyards, Riad Vert actually offers you a pool warmed up by the sun and with a view. Rooftop pool at Riad Vert… Winning! Could I please, please, pretty please, move here? My boyfriend would probably kill me, but this is exactly how I would like my house to look like. Beautiful moroccan tiles everywhere, dreamy little corners, and stunning rooms overlooking the even more stunning courtyard. Riad Be is my favorite of them all. Every room is different, having fresh flowers and candles lit. This place is perfect for a city trip with the girls (sorry guys, I’m afraid it might be a bit too much for a guys only party), or as romantic getaway. The guys who receive you are incredibly friendly, knowing a word or two in dutch and more than happy to assist you in any way. Pink bedrooms! Does it get any better? An instragram hype, and not without reason. Le riad Yasmine has the most beautiful swimming pool surrounded by palms and banana plants. The rooms are just as beautiful as their insta-famous courtyard, with colorful moroccan rugs and mosaic bathrooms. You can have your breakfast either in the garden or at the rooftop, depending on the weather. However, if the sun’s shining than definitely choose the rooftop. The views from up there are amazing, with the Koutoubia minaret and the Atlas mountains on the horizon. I do have to warn you, Instagram has done its marketing magic, so the place is fully booked till 2018. But never hesitate to give it a try, because when you do get in, you’ll have the most amazing stay. Great spot for sundowners, right? Insta-famous… can you blame them? Riad Adore has a modern feel, but hasn’t lost its Moroccan touch. So when all the tiles and arabic touches are a bit too much for you, this place will make you feel at home. The minimalist modern style doesn’t compensate on comfort however. With a beautiful pool, spacious unique rooms, a hammam with various spa treatments and a rooftop terrace with stunning views Riad Adore really is a place to unwind. Very close to the entrance of the souks and around the corner of the Djemaa el fna, this riad has the perfect location. Just in a little side street of one of the busy souks you’ll find this beautiful riad hidden away. The moment you enter the door there’s a vibe of tranquility due to the great jazz music and the relaxing courtyard with a pool. The rooms are as beautiful as the courtyard, with bathrooms that look like your own private hammam. 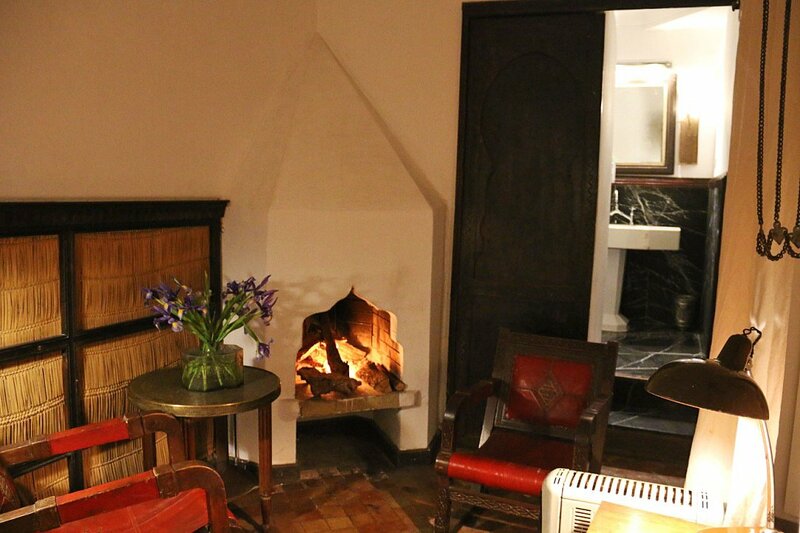 If you’re visiting in winter the fireplaces in your room and anywhere else in the riad will be lit. How romantic does that sound? Riad al Massarah is a modern, yet luxurious riad that awaits you with the warmest welcome. The beautiful Riad Khol is located about ten minutes from the Djemaa el fna square in the middle of the old medina. This riad is so well decorated. With dark hues, great smelling fragrant candles and orange trees in their courtyard. The place feels like a true 1001 night fairytale, being very mysterious and all. Their great rooftop terrace has 360 views over the medina and the Atlas mountains in the background. So sip on your mint tea after a day strolling around the souks or start your day here with a delicious breakfast. Great add on to this riad is that they have an in-house hammam! After spending a bit of time in Marrakech and visiting all those riads, I’m an absolute fan of this form of accommodation.They are all different in style, but so similar in great service and hospitality. While staying in a big hotel can be very relaxing, you do really notice the difference in care. The riad staff really tries to make you feel at home. After all those Marrakech impressions and days strolling around the medina, how good is it to come home to a mouthwatering home-cooked meal and a comfy bed in a beautiful room? Sleep like a queen and enjoy this 1001 night fairytale. Riad Vert lives up to its name.. green everywhere! Great post. I hope to get to Morocco soon and will use your guide. Thanks so much! Have lots of fun in Morocco when you go.. it’s an amazing city! All of them! I would like to spend a night in all of them, they look so nice and beautifully decorated. Like someone really cares (something I miss at many places). Beautiful photos as well, great post! We’ll be back in Morocco for sure, so I’ll keep this in mind. I totally understand! Just do a week of Riad-hopping with a few hammam days in between.. 😉 Guaranteed success! You left out the most beautiful and authentic riad…Palais Sebban.